Random House Books for Young Readers, 9780449814307, 32pp. A rollicking book that reminds young readers to go outside and play! Nothing takes the place of splashing in a puddle or jumping into a pile of autumn leaves. Along with the mud and sand that gets tracked indoors come memories that live forever! Mary McKenna Siddals has written a joyous anthem that encourages children to play in the dirt. It will surely resonate with today’s overscheduled as well as sedentary kids, and their parents. 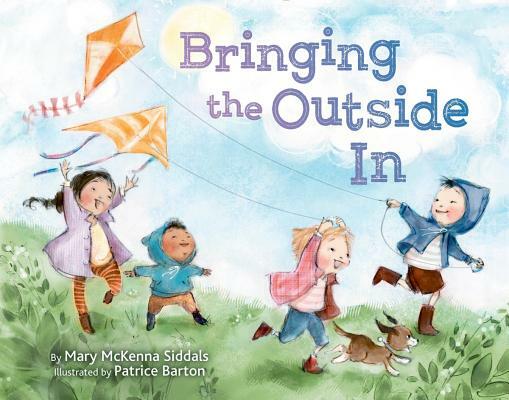 MARY McKENNA SIDDALS is a former teacher who has written a variety of picture books, including most recently Shivery Shades of Halloween: A Spooky Book of Colors. She also penned the critically acclaimed Compost Stew: An A to Z Recipe for the Earth, and the perennial favorite Millions of Snowflakes. Learn more about Mary at siddals.com. PATRICE BARTON has illustrated many picture books, including Uh-Oh!, MINE!, I Pledge Allegiance, I Like Old Clothes, and Rosie Sprout’s Time to Shine. You can find out more about Patrice at patricebarton.com.